Asthma and allergies are common ailments that affect millions of Americans. As many as one in every five individuals suffers from either asthma or some form of allergies. An estimated two million adults over 65 suffer from asthma. Poor indoor air quality can trigger allergic symptoms and symptoms of asthma. The air inside our homes and workplaces may be as much as 100 times more polluted than the air outside. This is because allergens and contaminants become trapped inside the home or workplace and circulate throughout the ventilation system. One common trigger for allergic and asthmatic symptoms is pet dander. Many households in the U.S. include at least one dog or cat. Pet dander is released into the air and the particulates are inhaled by inhabitants of the home. In addition to pet dander, other factors contribute to poor air quality. Those with allergies or asthma are particularly sensitive to poor indoor air quality. Several factors contribute to a degradation in the quality of indoor air. Smoking inside the home, using household pesticides and other VOCs and cleaning with strong chemicals release contaminants into the air. Because people spend up to 90 percent of all of their time indoors, individuals tend to breathe in a considerable amount of pollution if the indoor air quality is compromised. Those with asthma and allergies are even more sensitive to the effects of poor indoor air quality. Allergic and asthmatic symptoms not only cause people to suffer but symptoms of asthma and allergies are also associated with monetary cost. Four million work days are lost per year due to “hay fever”, a common name for allergies. Asthma is responsible for an estimated 10 and one half million lost school days per year. Allergy treatments and medications for asthma represent billions of dollars in health care costs. Allergies cost the health care system and businesses nearly $8 billion per year. Improving indoor air quality and minimizing symptoms of allergies and asthma has even garnered the attention of the EPA in recent years. Numbers of individuals who suffer from either allergies or asthma or both continues to rise each year. 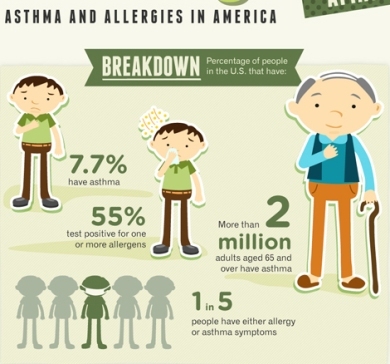 View the infographic at Oransi for stats on asthma and allergies in America.